He set numerous records, going higher than any Central Coast Section pole vaulter had ever gone before. But for Los Gatos senior Nico Weiler the most memorable moments of his high school career weren't at the big meets such as the state finals vaulting in front of thousands of fans. The times that stick in his mind are the day-to-day workouts at the Wildcats' track. "Every day in practice with my teammates, that's what I'll remember most," said Weiler, a native of Stuttgart, Germany, who won his second consecutive state championship with a meet record of 17 feet, 3 inches. "We were a small group that stuck together. We had a real team dynamic and had a great time traveling. We worked as a team, and I'm proud of that." Weiler's personality played a big part in the Wildcats' run to a tie for second place at the state meet, Coach Brandon Vance said. "Nico exudes this excellence that causes people to rise up and do their best," Vance said. "He seemed to inspire his teammates." Weiler ended his high school career as a two-time state champion and a two-time CCS champion. His mark of 17-6 1/4 in the CCS finals last year is a section record. 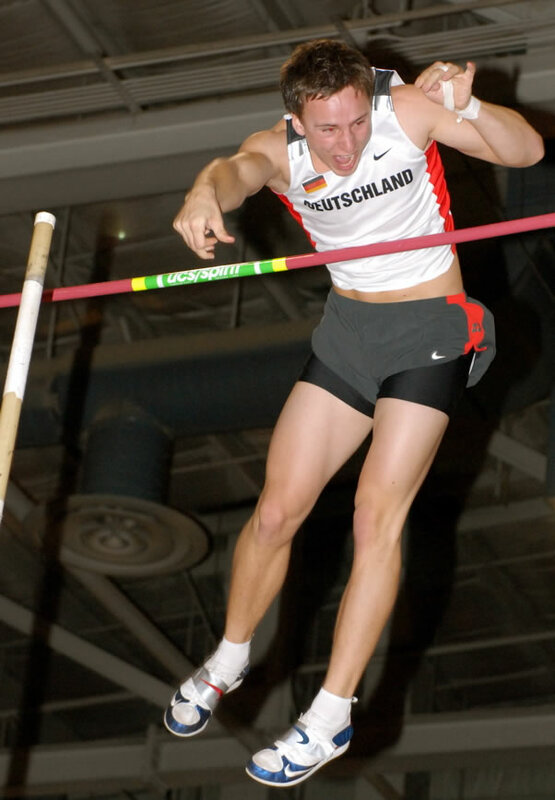 In practice sessions, Weiler has vaulted 18 feet, and his goal is to clear 18-4 this year. But he'll have plenty of time to work on that as he continues his career at Harvard, and possibly beyond. He would like to represent Germany in the 2012 Summer Olympics. "I love vaulting because I'm a perfectionist," Weiler said. "No other sport takes as much skill and athleticism. I'm drawn to it because it's almost impossible to do it perfectly." He also uses the sport to escape the stress of daily life. "When you're vaulting, it literally takes you away from everything because you are concentrating so much," he said. "Then you jump and get that sensation of free falling. It's the best feeling in the world." By winning three events at the 90th annual CIF State Track and Field Championships, Mt. Pleasant's Vashti Thomas put her name among the all-time greats in California history. As she walked around the stadium at Cerritos College, fans acknowledged Thomas' achievements. "A lot of people would start clapping when I walked by," Thomas said. Thomas became the first California girl to win three events in one year since Chino's Angela Williams in 1998 and only the fourth to triple in one meet in state history. Woodside's Wendy Brown accomplished the feat in 1984, and Thousand Oaks' Marion Jones pulled it off in 1993. Thomas won the long jump (20 feet, 1/4 inch), triple jump (42-0 1/2) and repeated as the 100-meter hurdles champion (13.44 seconds). 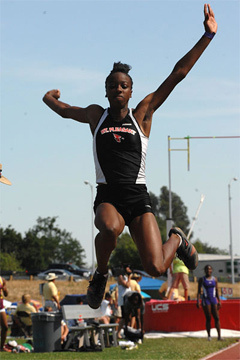 Thomas, who will compete at Texas A&M, set a Central Coast Section record by winning 10 individual titles in her career. She is brushing up on her sport's history and dreams of someday making more of her own. "I love to watch the Olympics," Thomas said. "It's so cool watching athletes like Allyson Felix compete. I would love to be at that stage someday." Mt. Pleasant Coach Steve Nelson thinks the potential is there. He first saw Thomas as an eighth grader and later put her through a battery of drills to test her athleticism. "We thought she could be the next Jackie Joyner," Nelson said. "She hadn't done anything but she had huge potential." Thomas has worked to maximize her talents. She has become a team leader and has learned what Nelson calls "track savvy" - the ability to hold something back early in big meets to leave something in the tank for the finals. Thomas competes this weekend in the Junior Nationals in Ohio, hoping for a top-two finish in the 100 hurdles and the triple jump to earn a spot representing the United States at the Junior Worlds in Poland in July. "An NCAA title is a real possibility," Nelson said. "Vashti is the best athlete I've coached. She is the kind of person who could make it to the Olympics."